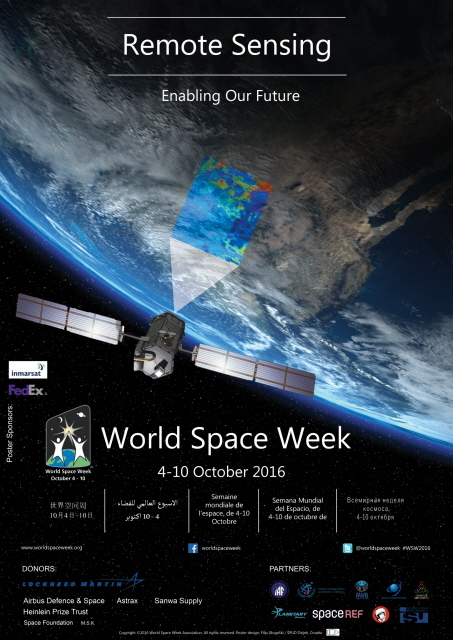 We are pleased to announce the release of the official poster for World Space Week 2016. The poster has been designed by Mr. Filip Glogoški, a 17-year old artist from Croatia. Filip is a student of the School of Applied Arts and Design in Osijek, Croatia. He worked under the supervision of his mentor, Professor Josip Kaniža, to create the poster under the 2016 theme “Remote Sensing: Enabling Our Future”. The poster captures the role that remote sensing plays in illuminating our understanding of the planet and in helping us live in a sustainable manner. Thanks to our 2016 Poster Sponsors, FedEx Space Solutions and Inmarsat, the official poster will be printed and made available to event organizers through the national coordinator in each country. You can find your national coordinator in this list. For more information on the theme for WSW2016, please read this article. The final version of the poster will be made available for download soon on the website.